Check these little ones out! This means we need to go check out the abandoned asparagus farm this weekend. We usually find a few the deer have missed. So far, this is the way the spring growing season has gone for me: The greenhouse contents are growing too quickly. The things in the gardens (perennials, bulbs, newly-planted peas and favas and spuds) far too slowly. The stuff under the lights in the basement, likewise, too slowly for impatient Me. Oh, and it’s been freezing the past 6 or so days, and will be for a while. Ah. Beautiful asparagus! Does it keep its pinkish/purplish color? ooooh, wild asparagus on the hoof! such a beauty, I love her purple self! so jealous! must check the patch when I get home for lunch… maybe there is a surprise waiting for me? We think we are going to try asparagus one year in our garden. Not this year, maybe next. I love the stuff. Used to pick it when I was a youngster, way back in the day, for a family from church in Baroda. Boy, now that was back breaking work. Robbyn (HI! great to hear from you), yep, they keep their color, at least, until I cook them. Then they’re all green. But, with the really early ones, they just get chopped up and thrown atop the salads. Yum! Hayden, yeah, along every roadside here, there are tons of the things. In our yard there are tons, too. It helps if you mow things down, I guess! So I am saying we harvest from our land too but these precious things were found in their coddled perennial bed. Making do with some lovely ramps for the time being. Do you have any? Danielle, I saw yours yesterday, with a pang of green jealousy! But not too much as I am cleaning out the greenhouse now and dang I am at the point where it’s nearly impossible to eat. another. green. thing. But yes, every year I think I need to plant more, but every year I don’t as they’re so available if I simply bother to go for a walk to get them. Marcy: Well, when we hit the abandoned asparagus farm this week, I will check again in the one area I found them a couple of years ago. I think we got there too late last year. We’ve got wild onions and garlic coming up now, but believe me, they’ve got nothing on wild asparagus! I’ve got some poking their heads up, but nothing harvestable yet. 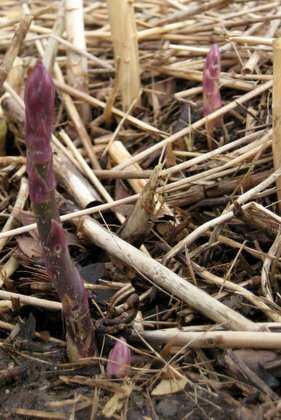 Although with asparagus, when you see a two inch stalk in the morning, by 5pm it’s practically flowering and inedible. Spring moves so fast. That photo brought me out lurkerdom. Absolutely delicious! Meredith: You’re right, if it’s warm especially these guys really get going quickly, don’t they??? Mary! Great. I love de-lurkers. And you reminded me I should probably go outside and take a look at them.